Furnaces that run on heating oil contain a storage tank into which oil is deposited. The oil travels through a pipe and eventually is dissolved into a misty air. This combination lights a spark to create a flame, heating the air through a duct system inside the home. These systems are measured by the unit’s Annual Fuel Utilization Efficiency (AFUE), which calculates what percentage of energy heats the home, and what percentage escapes to the outdoors. On the other hand, heat pumps include an outdoor compressor paired with a copper tubing and aluminum fin apparatus. The coils draw heat in from the air and evaporate that warmth into a gas. Inside the indoor coil there is a refrigerant that condenses the heat back into a liquid, which consequently releases heat back into the home. Efficiency of a heat pump is measured by the total heating space divided by the electrical energy consumed, which should be around 7.7 at the minimum. It’s hard to compare the prices for these two very different systems. Heating oil measures price by gallon, which currently averages about $2.80 per gallon. 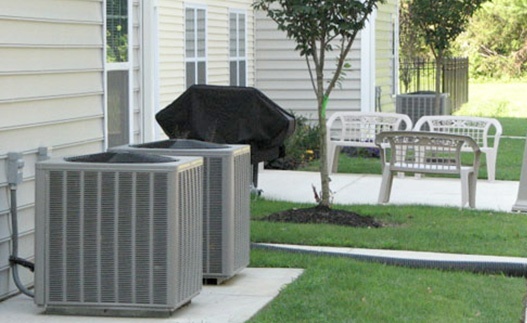 Heat pumps on the other hand have a one-time cost, plus the additional cost of routine maintenance and tune-ups. His Back is to the Ropes! Although each heating system is efficient at heating your home, the heat pump is not advised for extremely cold climates. Moderate climates are preferred since outside air is being pulled in and manipulated to heat the home. But if you live in a moderate climate, either system could improve the way you heat your home. Be sure to check out current rates in order to see which system is right for you! Tune in next week where we will see the Heavyweight Champion Heating Oil continue his conquest against the nimble Natural Gas!